Insulating your home is pure and simple the number one way to save money on energy costs. In the old days, floors and walls were lined with just about anything to keep the moisture and cold air out of the home. Renovations have revealed that even old newspapers were found packed into wall and floor boards. One of the top rated insulations is relatively new to the industry, probably no more than a couple of decades old and that is a blow in insulation. 1. Blow in insulation is adjustable. Depending on how much material is used, it can create a protection with an R-value of 15-60. 4. Installing blow in insulation is fast. A barrier referred to as a blanket is stapled to all of the 2x4s to keep the material from floating away and adhering where it isn’t wanted. Then a small slit is cut into the blanket. A hose is inserted, and measured amounts of the insulation are blown into place. The Complete Installation Process After attaching the blanket to the surrounding boards, the small opening cut into it allows the hose to be pointed in all directions around the wall or ceiling. After the material is in place, the blanket’s slit is closed and taped. This blanket does not act as a moisture barrier; it just control the spray. The material itself resists moisture. Drywall or other wall materials are then installed right over the insulation blanket. In a renovation project, this means that an entire wall would not have to be removed in order to insulate. Take a timeworn home for example. There may be no insulation at all. Instead of removing layers of plaster wall, you could simply make a hole, position the hose and fill the walls will energy-efficient insulation. Then patch the wall and the job is complete. 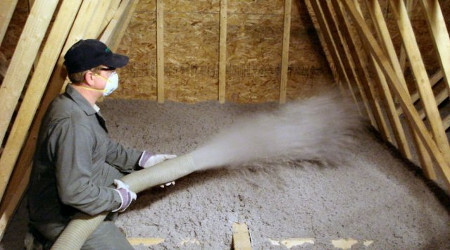 The blow in insulation is more expensive than traditional insulation. However, experts estimate that energy savings are so great that within 2 to 4 years those costs are recovered. I haven’t replaced the insulation in my attic for a really long time, and I think it’s time. After reading your article, I’ll make sure that I use blown in insulation so that it can be installed, and so I can the most efficiency. That way I can get it installed as quick as I can and start enjoying the benefits of new insulation. It’s interesting that the material itself is water resistant. As I was reading the article I was wondering if the plastic sheet was left installed to act as a vapor barrier or removed. I imagine that it’s a good idea to leave it installed to keep the insulation material contained and working the most effectively.